Visualize if carbon dioxide (CO2) could easily be transformed into usable energy. Every time one drives a motor vehicle or breathes, a key component for producing fuels will be produced. Similar to photosynthesis in plants, CO2 could be converted into molecules that are vital for day-to-day life. Now, researchers are one step closer. A team of researchers at the U.S. Department of Energy’s (DOE) Brookhaven National Laboratory are part of a scientific partnership that has identified a new electrocatalyst that efficiently changes CO2 to carbon monoxide (CO), an extremely energetic molecule. Their findings were reported in Energy & Environmental Science on February 1. For a long time, researchers have pursued a way to convert CO2 to CO, but traditional electrocatalysts cannot successfully initiate the reaction. That is due to a contending reaction, called the hydrogen evolution reaction (HER) or “water splitting,” takes precedence over the CO2 conversion reaction. Some noble metals, such as platinum and gold, can avoid HER and change CO2 to CO; however, these metals are comparatively rare and very expensive to serve as cost-efficient catalysts. Therefore, to turn CO2 to CO in a cost-effective manner, researchers used a totally new form of catalyst. Rather than noble metal nanoparticles, they made use of single atoms of nickel. Nickel metal, in bulk, has rarely been selected as a promising candidate for converting CO2 to CO. One reason is that it performs HER very well, and brings down the CO2 reduction selectivity dramatically. Another reason is because its surface can be easily poisoned by CO molecules if any are produced. Single atoms of nickel, however, deliver a different result. Besides the unique energetic properties of single atoms, the CO2 conversation reaction was enabled by the interaction of the nickel atoms with a surrounding sheet of graphene. Anchoring the atoms to graphene allowed the researchers to adjust the catalyst and suppress HER. To obtain a closer look at the single nickel atoms within the atomically thin graphene sheet, the researchers used scanning transmission electron microscopy (STEM) at Brookhaven’s Center for Functional Nanomaterials (CFN), a DOE Office of Science User Facility. By scanning an electron probe over the sample, the team was able to picture discrete nickel atoms on the graphene. 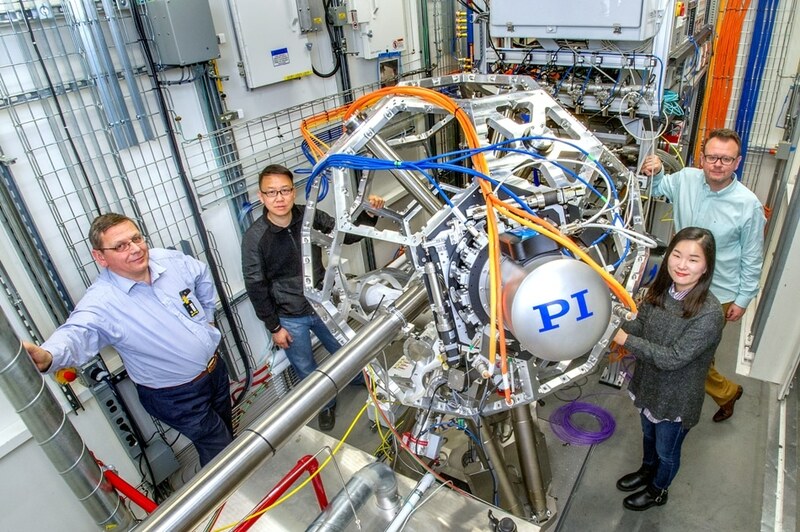 To examine the chemical complexity of the material, the researchers used beamline 8-ID at the National Synchrotron Light Source II (NSLS-II)—also a DOE Office of Science User Facility at Brookhaven Lab. The ultra-bright X-ray light at NSLS-II enabled the researchers to “see” a complete view of the material’s inner structure. Photons, or particles of light, interact with the electrons in the nickel atoms to do two things. They send the electrons to higher energy states and, by mapping those energy states, we can understand the electronic configuration and the chemical state of the material. As we increase the energy of the photons, they kick the electrons off the atoms and interact with the neighboring elements. This provided the team with an image of the nickel atoms’ local structure. Based on the findings from the studies at Harvard, NSLS-II, CFN, and other institutions, the team discovered single nickel atoms catalyzed the CO2 conversion reaction with a maximal of 97% efficacy. The researchers say this is a key step toward recycling CO2 for usable energy and chemicals. This research was supported partly by the Rowland Institute at Harvard University. Operations at CFN and NSLS-II are supported by DOE’s Office of Science.